Swarovski crystal resource to explore discontinued crystal figurines, retirements, and ornaments at Retired Swarovski . com! Retired Swarovski . com is keen to Swarovski Crystal Collectors! browse through the list of Swarovski crystal figurines from the Silver Crystal product line in our library. read an interesting article covering recent Swarovski news. find a safe way to purchase retired Swarovski Crystal figurines and collectibles on your wanted list or find buyers for extra crystal that you want to sell. discover indispensable Price Guides for Swarovski Crystal, with facts about and images of current and retired items in ALL lines, including SCS, Silver Crystal, Crystal Moments, Home Accessories, Crystal Myriad, Paradise, Chinese Zodiacs, Trimlite, Lovlots, Zodiacs, Disney Collection, Hello Kitty, and Soulmates. Also included in the books are Swarovski Ornaments, Swarovski paperweights, and other items made using Swarovski components. get answers to questions about what to do if your Swarovski figurines are broken and require a process of restoration Swarovski. 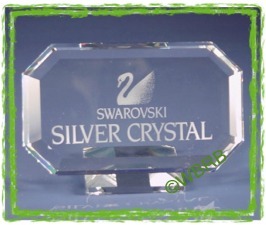 become informed about Swarovski value to properly insure your Swarovski crystal collection. become a reader and follower of KristallBuzz.com , a Blog on Swarovski Crystal, to stay in tune with the current Swarovski Buzz news and Swarovski crystal collecting trends. get some very helpful hints on how clean Swarovski crystal figurines. A plethera of crystal figurines information about discontinued Swarovski awaits collectors right here at RetiredSwarovski.com. Our easy-to-use menu has many useful options with information on buying and selling retired Swarovski, insurance price guides on Swarovski, helpful hints on how to clean Swarovski crystal figurines, and repair / restoration of Swarovski crystal figurines. Click on the links in the menu to the left to take advantage of this excellent resource for avid Swarovski crystal fanatics. Or click on the tabs above to go directly to the websites of the Swarovski expert sponsors of this fine Swarovski crystal resource, to make use of their relevant and beneficial products and services!